Chocolate Island 3 is a level in Super Mario World in the Chocolate Island world. It is a daytime sky level with lots of rotating platforms. Many enemies patrol the center of the moving platforms: first Koopa Troopas and then Fuzzies orbiting the center. Capes are the favored power up in the level. ? Blocks (after Mario has collected a Super Mushroom) emit Cape Feathers rather than Fire Flowers. A Green ! Block that appears once also contains a Cape Feather. As mentioned before, there are many rotating platforms over a bottomless pit throughout the course in addition to some occasional solid ground. There is a Warp Pipe halfway through the level that takes Mario or Luigi into a room full of coins and one Dragon Coin. After the Pipe is the Midway Gate in midair with a ? Block immediately after it. Towards the first Goal Gate is a Bonus Block and arrow signs under the Giant Gate possibly hinting the player to go to the second Giant Gate. There are two exits in the course, both in the same room and as Giant Gates. The main exit can be reached by a Beanstalk after hitting a Rotating Block. The other exit is across a wide bottomless pit that must be reached by using cape or a flying Yoshi. 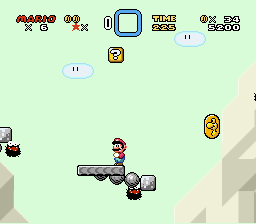 Three 1-Up Mushrooms appear in Rotating Blocks before the second exit. The first exit opens a circular path around the mountains (which leads Mario in a circle and is practically useless, but is still needed for a perfect score). The other exit leads to Chocolate Fortress. Chokorē-tō Kōsu 3 A portmanteau between ｢チョコレート」 chokorēto (chocolate) and 「島」 -tō (Island, as used in names); effectively "Chocolate Island Course 3".